Are you a big rossiniano interpreter What qualities or technical believes should be to be a good interpreter rossiniano? The rossiniano edge requires a very particular technical; We can call Rossini style "il bel canto fiorito". You need to know to keep the tessitura, which in many cases it is quite high, besides having the vocal agility. It is important, especially, know the style of writing well and know Rossini vary the ridge line where it should. It is about, definitely, a set of very specific things. Ah, I forgot: all this must be done at the same time and with extreme ease. The last summer, He reprized the Conte d'Almaviva, in the new production The Barber of Seville, Rossini Opera Festival in Pesaro, stage direction of Pier Luigi Pizzi. What are the challenges this role? Yes, is one of my favorite roles Rossini, and every time I have to sing, I thank this magnificent role Rossini. Even if he might have to thank Manuel García more? 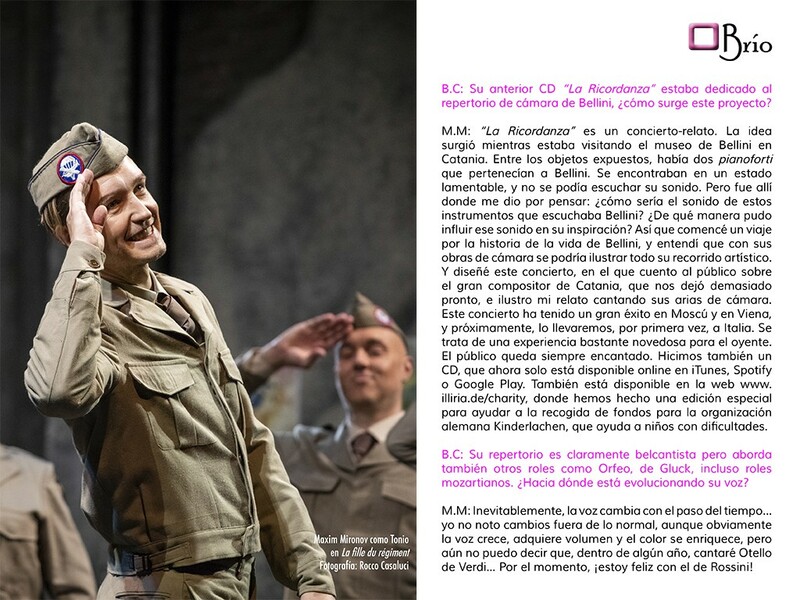 Who knows what this great tenor in the past has contributed to the creation of the character of Almaviva! If the role is as in Pésaro, that is to say, Integral with the end rondó, the difficulties are brutal. It's a long role, demanding from the point of view actoral, full of disguises and movements. Is, Besides, a very dynamic role to be crowned with final rondo full of coloratura. But the feeling of satisfaction you get after you did makes you forget any difficulty. What other roles Rossini would like to do in the future? Actually, after so many years working in the Rossini repertoire, there are few roles that I debut, but I could point to three I want to do in the future: Le Comte Ory, Corradino en Matilde in Thabran and Ilo, in Zelmira. 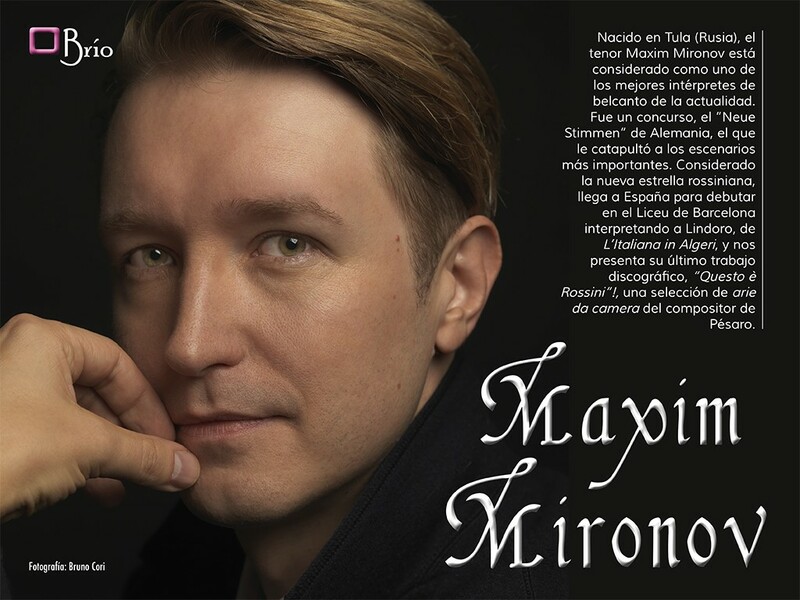 If publica ahora "This is Rossini!”, a selection of arias accompanied by piano chamber by Richard Barker, a nineteenth-century piano, similar to that used by Rossini and coinciding with the anniversary of his death. How you have lived this experience? It is the result of hard research work, but very interesting, I've done with my great friend, Master Richard Barker. The truth is that has always fascinated me chamber music; I think in this genre composers had much more freedom of expression and, especially, experimental. In the chamber music repertoire of each composer we can find real gems, they often fall into oblivion. So with this CD we want to bring to light lesser known works of Rossini and empower them to be interpreted. We used a historical instrument to record this album: Pleyel very similar to that used the same Rossini. The period instrument sound is unmistakable and catapults you, Instantly, to the past, producing an almost magical effect. the touch, we can feel what I felt the same Rossini. 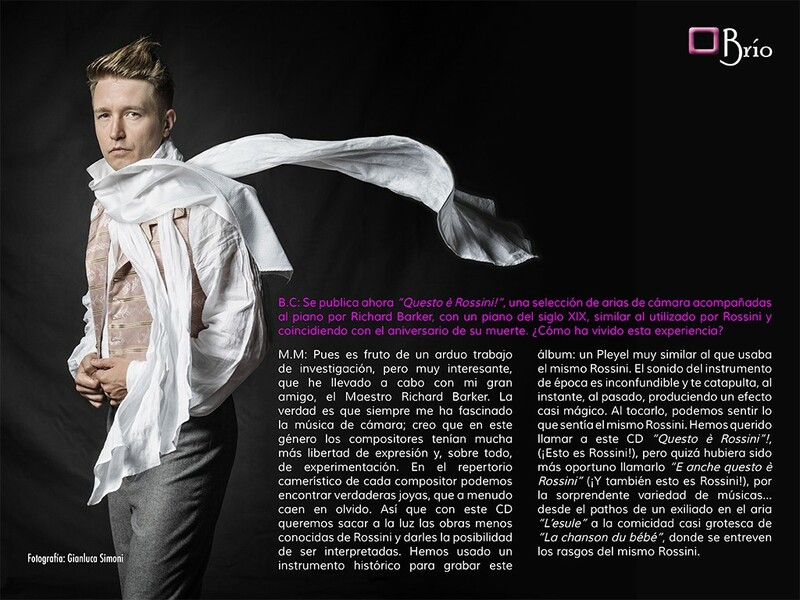 We wanted to call this CD "Questo è Rossini"!, (This is Rossini! ), but perhaps it would have been more appropriate to call it "E anche questo è Rossini" (And also this is Rossini! ), by the amazing variety of music ... from the pathos of an exile in the aria "L'esule" the almost grotesque comedy of "La Chanson du bébé", which features the same glimpse Rossini. 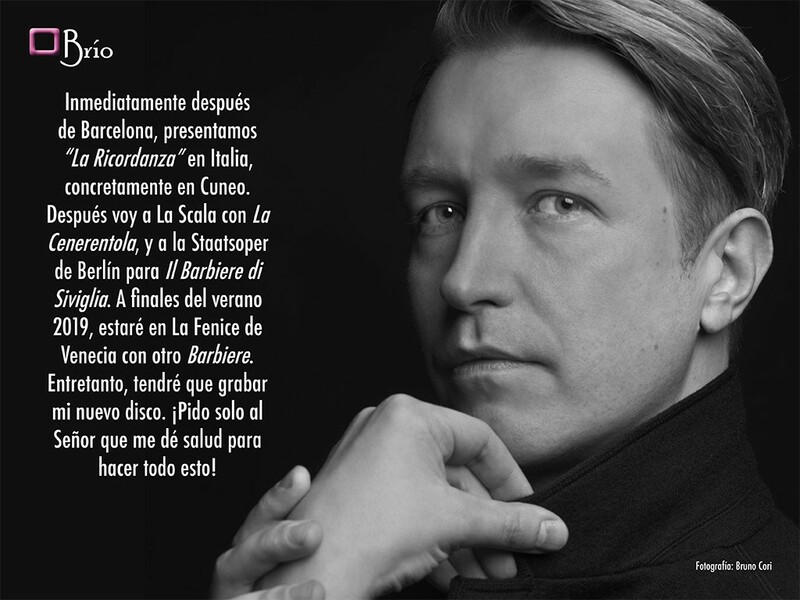 His previous CD "The Ricordanza" was dedicated to the repertoire of chamber Bellini, How this project came? "The Ricordanza" is a concert-story. The idea came while he was visiting the Museum Bellini in Catania. Among the exhibits, there were two pianos They are belonging to Bellini. They were in a sorry state, And you could hear the sound. But it was there that I got to thinking: How would the sound of these instruments listening Bellini? How does that sound could influence his inspiration? So I began a journey through the history of the life of Bellini, and I understood that his chamber works could illustrate his entire artistic career. And I designed this concert, in which I tell the public about the great composer of Catania, which left us too soon, and illustrate my story singing their arias camera. This concert has had great success in Moscow and Vienna, and soon, we will take, for the first time, to Italy. It is a fairly novel experience for the listener. The public is always happy. also we made a CD, which it is now only available online an iTunes, Spotify o Google Play. It is also available on the web www.illiria.de/charity, where we have made a special edition to help collect funds for the German organization Kinderlachen, which helps children with difficulties. 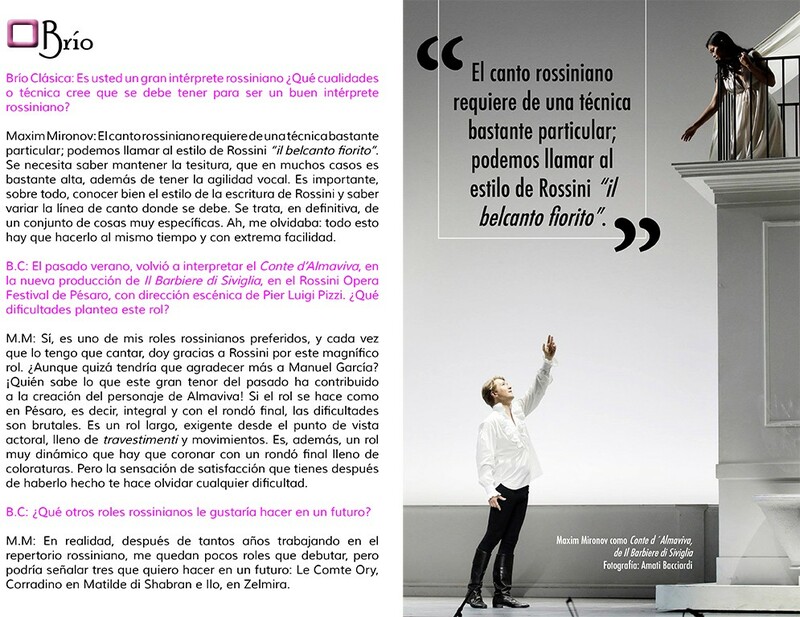 His repertoire is clearly belcantista but also addresses other roles as Orfeo, Gluck, even Mozartian roles. Where he is evolving voice? Inevitably, the voice changes over time ... I do not notice unusual changes, although obviously the voice grows, acquires volume and color enriched, but still I can not say that, within a year, sing Otello Verdi ... Nothing, I'm happy with Rossini! Where do you feel more comfortable, performing arias full of ornamentation or more dramatic arias? I prefer the arias, where they know how best to express the will of the composer. The fact that they are with or without coloratura, unimportant. 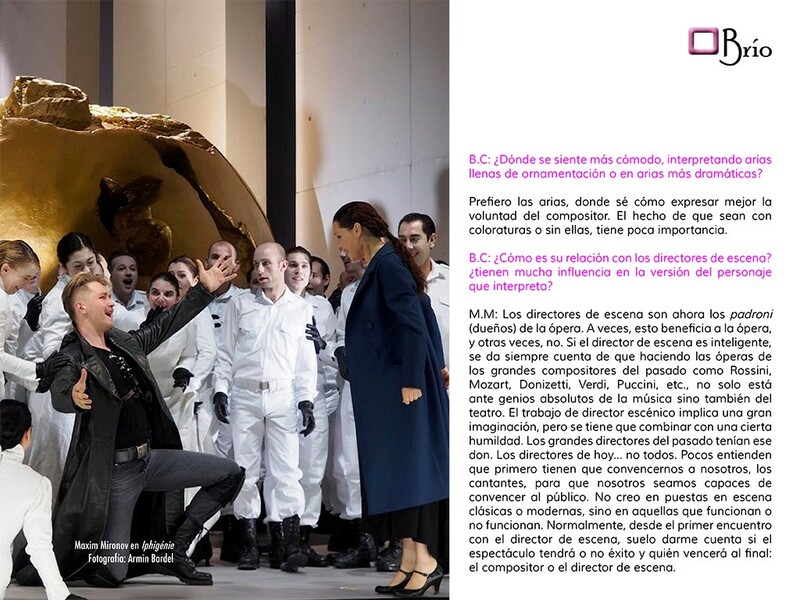 From 13 Lindoro in December will The Italian Girl in Algiers, Liceu in Barcelona, How do you approach this role? Lindoro is a complex character that we perceive today very differently than was created at the beginning of the nineteenth century. Lindoro comedy came from the fact that, in this opera, it is the woman who plays a man: She part of Italy to Algiers, Mustapha seduces, freeing the slaves. But if I had not come to save Isabella, he would have been equally well in Algiers. It was the favorite slave of Mustafa! Also from the vocal point of view, writing is almost feminine, very sharp and full of ornaments. I try to create a very young character, a little naive and dreamy ... one of those people who do not know exactly where they are and escape from danger by the great fortune to have. We had the opportunity to see him in another The Italian Girl in Algiers in 2009, When can we hear again in Madrid? moment, I have no other commitments in Madrid, but I remember with great pleasure the period I was there, especially people working in the theater. I've never seen people so passionate opera working in a theater! Faced with a new role, How do you prepare and what items you consider? I always start studying first the arias, then the duets, trios, quintets... and so on to reach the final. In this way, I have enough time to mature arias. parallel, I also inquired about the opera: leo, I see things on the internet ... Today, We can benefit a lot from this media. How is your relationship with stage directors? Do they have much influence on the version of the character played? Stage directors are now masters (owners) Opera. Sometimes, This benefits the opera, and other times, no. If the stage manager is smart, is given always realize that doing operas of the great composers of the past as Rossini, Mozart, Donizetti, Verdi, Puccini, etc., It is not only to absolute geniuses of music but also theater. Stage director's work involves a great imagination, but it must be combined with a certain humility. The great directors of the past had this gift. Directors today ... not all. Few understand that they must first convince us, the singers, for us to be able to convince the public. I do not believe in set in classical or modern scene, but in those that work or do not work. Normally, from the first encounter with the stage manager, I usually tell if the show will or will not succeed and who will win in the end: composer and stage director. To end, What are your future engagements? 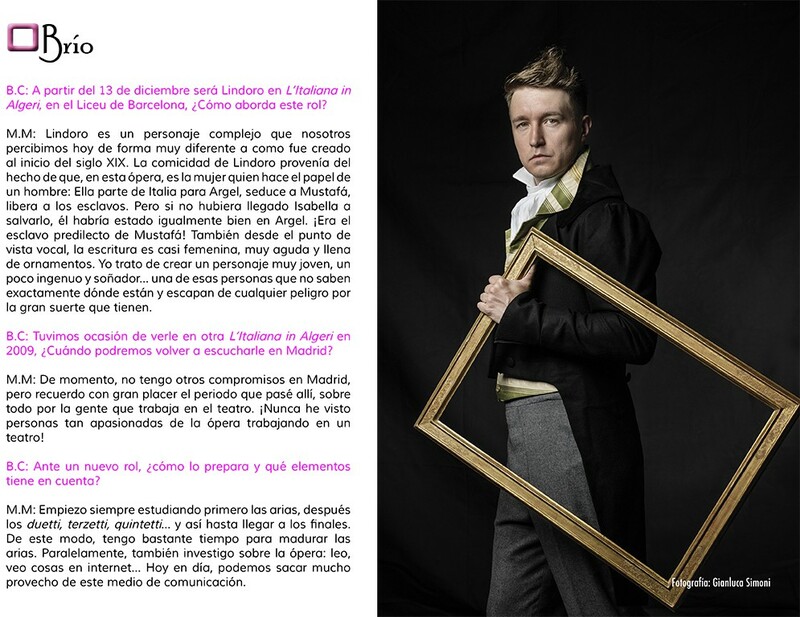 Immediately after Barcelona, presentamos "The Ricordanza" en Italy, specifically in Cuneo. Then I go to La Scala Cinderella, and the Staatsoper Berlin for The Barber of Seville. In late summer 2019, I'll be at La Fenice in Venice with another Barber shop. However, I have to record my new album. Just I ask the Lord to give me health to do all this!